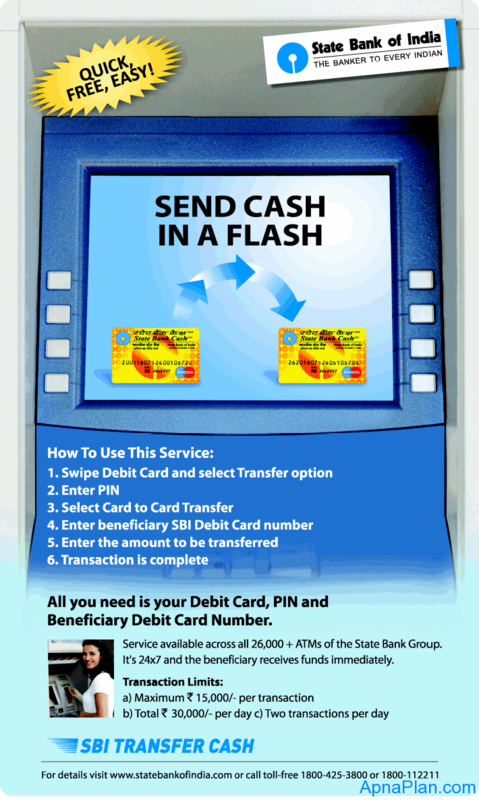 State bank of India (SBI) in association with MasterCard MoneySend Card to Card Service has launched “Send Cash in a Flash” Money Transfer Mechanism. This service seems to be pretty innovative and simple. Upto Rs. 15,000 can be transferred in a single transaction. The service is available at 26,000+ ATM’s of State Bank Group all over India. How does SBI Send Cash In A Flash works? Swipe your debit card and select transfer option. Select card to card option. Enter beneficiary SBI debit card number. Sending customer and Receiving customer receive SMS messages, if they have opted for SMS alerts. The Receiving customer can withdraw Cash from ATM or pay for Purchases via POS Terminals at Merchant Establishments. Your PIN Number should always be with you. Register your email id, for Bank Alerts. State Bank Group, Axis Bank, IDBI Bank and Punjab National Banks have currently opted for both the’ Money Send’ options i.e Send Money and Receive Money, via the State Bank Group ATM’s. ABN AMRO, Andhra Bank, Axis Bank, Bank of Baroda, Canara Bank, Central Bank of India, Citibank (Credit Only), Deutsche Bank, HDFC Bank, HSBC, ICICI Bank (Debit Only), IDBI Bank, ING Vysya Bank, J&K Bank, Punjab National Bank, SBI GE Cards, South Indian Bank, Vijaya Bank and Yes Bank, have opted for ‘MoneySend’, ‘receive funds’, facility only.